TORONTO (Reuters) - BlackBerry Ltd (BB.TO) (BBRY.O) reported a smaller quarterly loss on Friday and flashed encouraging signals about its hard-pressed smartphone business as well as its software and services sales, spurring a more than 4 percent jump in its shares. The Canadian company, a smartphone pioneer pushed to the margins by Apple's (AAPL.O) iPhone and devices running Google's (GOOGL.O) Android software, is now focusing more on software and services than on hardware as it works through a long turnaround. On the services front, the company reported a huge number of conversions in its second quarter to its heavily promoted new device management platform. But BlackBerry's hardware unit also offered hopeful news, posting an adjusted profit for the first time in five quarters, helped by lower manufacturing costs and strong demand for its low-end Z3 handsets in emerging markets. The Waterloo, Ontario-based company's revenue in North America rose from the previous quarter, but sales slipped elsewhere. Its total revenue was down more than 40 percent from a year earlier. "They're taking all the right steps, which is great. It's encouraging to see," said BGC Partners analyst Colin Gillis. "Now we've got to see what Chen can do about the revenue decline." BlackBerry shares were up 5.2 percent at C$11.45 on the Toronto Stock Exchange and up 4.6 percent at $10.26 on Nasdaq. Chen, who became BlackBerry's CEO in November, said the company has already taken 200,000 orders for its new squared-screened Passport smartphone, which went on sale on Wednesday and sold out on Amazon.com within six hours. Chen said he expects BlackBerry to release a second generation Passport device at some point down the road based on the much better than expected demand. He said the company would be "squeezed a little bit" on availability of the device this quarter. Chen has moved rapidly to cut costs, sell certain assets and strengthen the company's balance sheet. He said revenue declines are likely near a nadir, with growth expected to begin in calendar 2015 with the sales of new products and services. Chen said he expects software revenue to double next year from around $250 million in the current fiscal year as the company wins converts to its device management platform, BlackBerry Enterprise Service 10 (BES10). BlackBerry said it issued 3.4 million licenses for the BES10 platform in its second quarter, a sharp increase from the previous quarter, and that it may end a promotional program early due to its success. A quarter of the license signups came from rival mobile device managers. "We're encouraged by the company's growth in enterprise software licensees and aggressive cost-cutting measures," Morningstar analyst Brian Colello said. The success of Chen's turnaround plan depends to a large degree on whether the company's next BES upgrade helps boost sales. The new BES12 software is set for a mid-November launch. 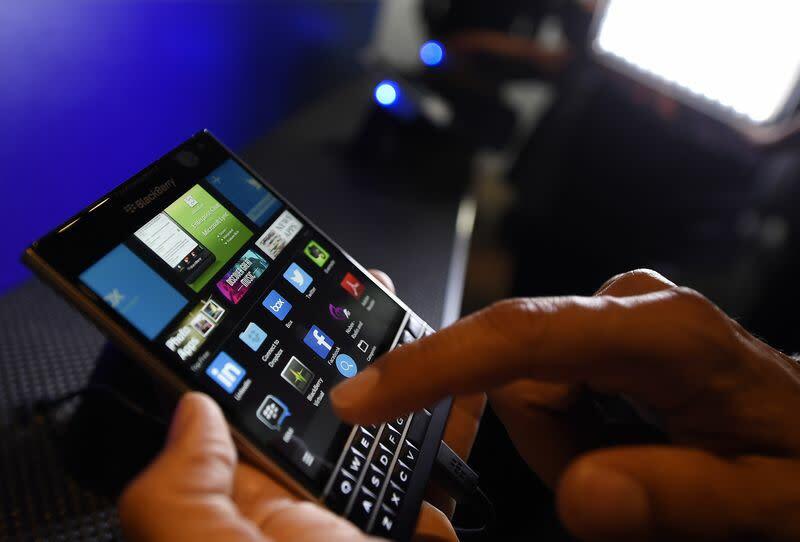 BlackBerry reported a net loss of $207 million, or 39 cents per share, for its second quarter ended Aug. 30. That compared with a year-earlier loss of $965 million, or $1.84 per share. Revenue was $916 million, versus $1.57 billion a year earlier. Excluding one-time items such as charges for restructuring, the loss was 2 cents a share. On that basis, analysts polled by Thomson Reuters I/B/E/S were expecting a 16-cent loss. The company said it does not expect its cash balance to drop below $2.5 billion in either the current quarter or the next one. Cash burn has worried some investors.